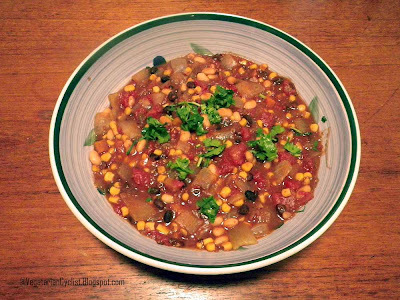 It is not Chili weather in Texas right now, but this afternoon, I set out to prepare a dish with beans, corn and tomatoes. I wanted the dish to emulate a warm salsa and I wanted it to be spicy. After some deliberations, I came up with a new recipe - Spicy Bean Duo! In a sauce pan, heat-up the oil. Add the onions and brown them slightly. Add the sambar powder, beans, corn and tomatoes. Cover and cook on medium heat for 5 minutes.